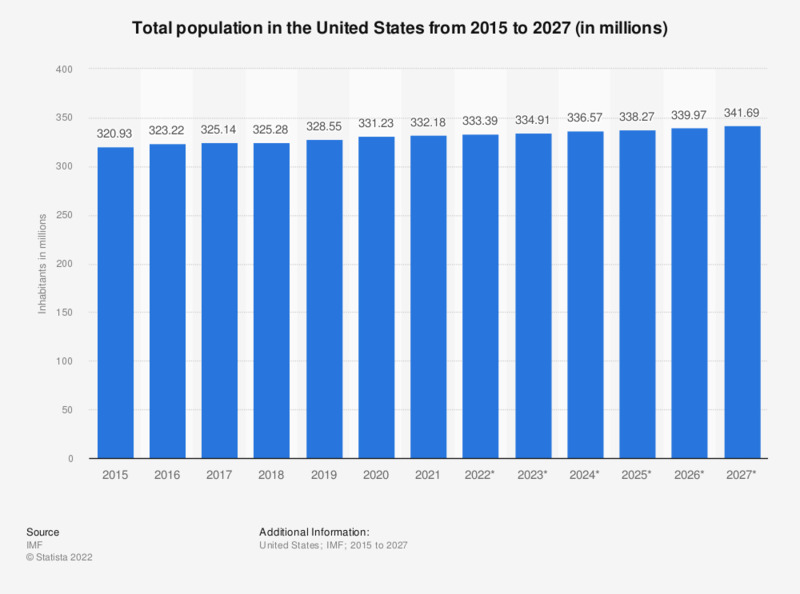 The statistic shows the total population in the United States from 2012 to 2017, with projections up until 2023. In 2017, the total population of the U.S. amounted to approximately 325.89 million inhabitants. The United States of America is the world’s largest national economy and the second most prominent trader globally, trailing just behind China. The country is also one of the most populated countries in the world, trailing only China and India. The United States' economy prospers primarily due to having a plentiful amount of natural resources and advanced infrastructure to cope with the production of goods and services, as well as the population and workforce to enable high productivity. Efficient productivity led to a slight growth in GDP almost every year over the past decade, despite undergoing several economic hardships towards the late 2000's. In addition, the United States holds arguably one of the most important financial markets, with the majority of countries around the world having commercial connections with American companies. Dependency on a single market like the United States has however caused several global dilemmas, most evidently seen during the 2008 financial crisis. What initially started off as a bursting of the U.S. housing bubble lead to a worldwide recession and the necessity to reform national economics. The global financial crisis affected the United States most drastically, especially within the unemployment market as well as national debt, which continued to rise due to the United States having to borrow money in order to stimulate its economy.